Tom Ford has released yet another highly collectable, limited edition cream eyeshadow this spring and with very little resistance (none actually) I rushed to get my hands on this. It was somewhat of an unexpected release as this was never presented at the initial Tom Ford spring preview I attended earlier this year; although I did see it being used backstage at the TF runway show in a Youtube video. After several weeks of hoarding/admiring and finally testing, here are my thoughts on this gorgeous cream pot. 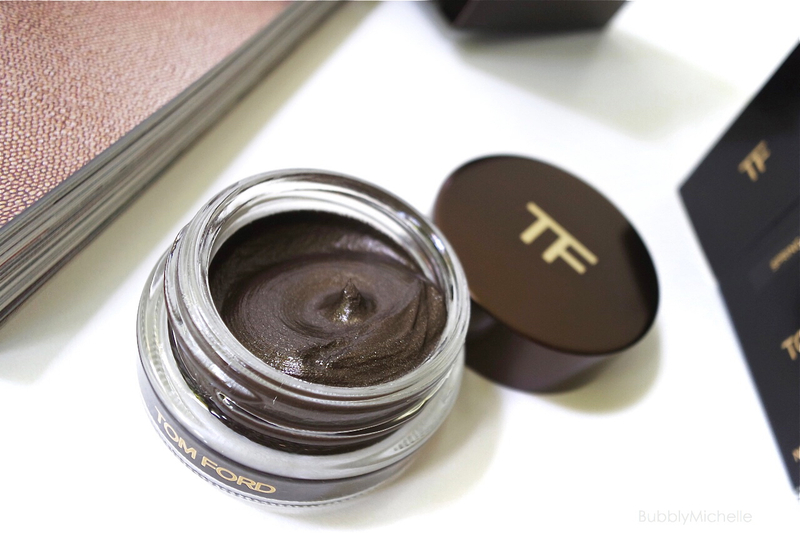 As always, starting with the packaging, the Tom Ford cream shadows come in a glass pot fitted with a plastic screw type cap with the TF logo in gold. The touch and feel of it is very luxurious and the farthest thing from flimsy, it’s got a nice weight to it. I also love that the cream inside is very well preserved by this packaging as even my older purchases are still in pristine condition and haven’t dried up even though I don’t reach for them often. Not the case with the Chanel cream shadows though, they always dry up inside! TF Spring 2015 cream eyeshadow is a deep neutral pewter brown with ultra fine silver shimmer. 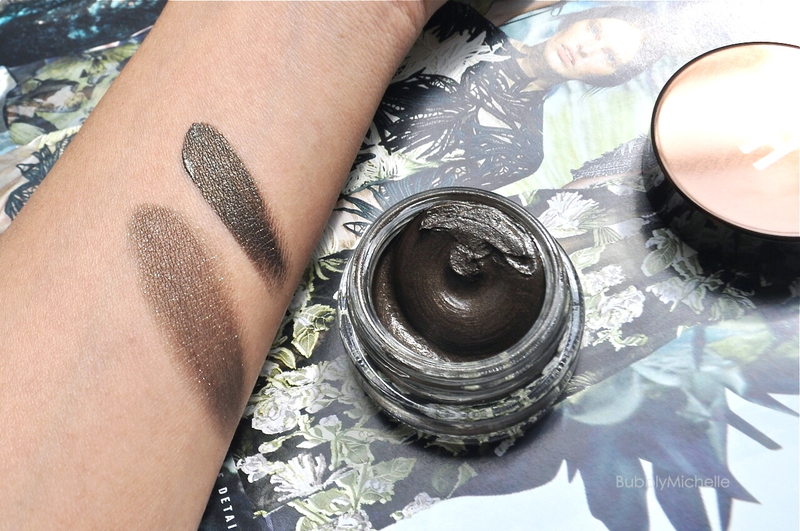 Although in the pot, this looks more chocolatey with slight khaki tones, when swatched it’s true colour is more of a pewter grey toned brown with hints of khaki in certain lighting situations. 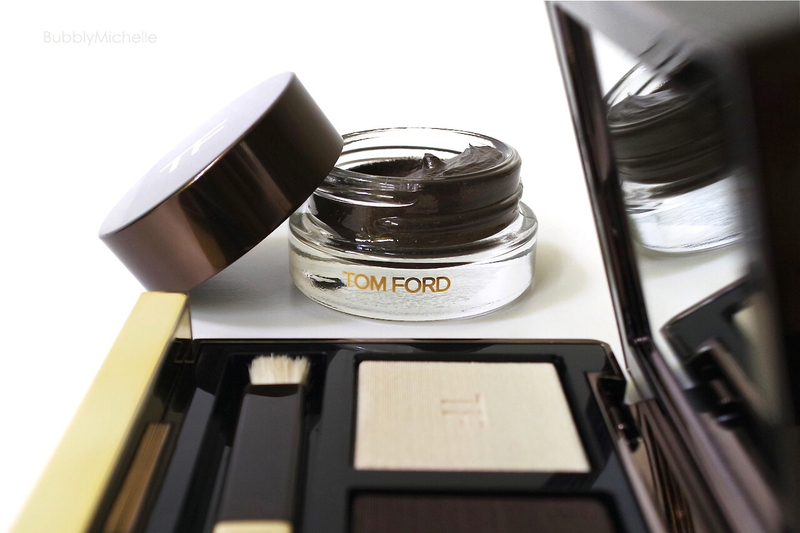 Overall the texture of the Tom Ford cream shadows are soft and almost moussey. They spread on the lids with no tugging and blend with virtually zero effort; which make them wearable on their own for a effortless smokey look. No eyeshadow required. For an intense (true to pot) colour deposit, the cream needs to be gradually built up, as adding a tonne of product all at once only creates a gloopy mess and would immediately transfer and crease on your lids as it’s so emollient. Gradual layering gives it more dry time between layers and creates a more uniform look. Personally I like to concentrate the colour more towards the lash line and blend out the edges using just my fingers. It’s the best method of application as I find using a brush required more patience, blending out the brush lines! Also worthy of noting, the texture of this allows more play time, so you don’t need to rush to blend it out before it sets! Once applied, the colour looks more glossy on the lids and very dimensional. A very forgiving look as the lids never look parched or tight and texture on the lids (if you have any) will not be emphasized. TF cream colours truly are the best for those with dryer eye lids or mature lids that are textured, although even those with oilier lids (myself included) can wear these without the fear of creasing or smudging. The wear time of these are exceptional. Mine lasted all day from 9 a.m to 8 p.m with no creasing or fading and I wore this straight on my lids WITHOUT primer and NO powder eyeshadow on top. Incredible. 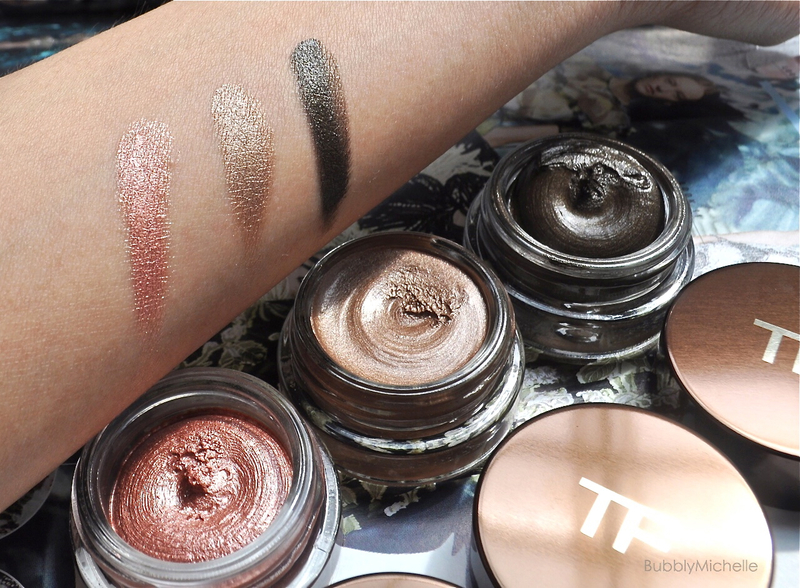 Here’re some comparison swatches of previous TF cream shadow releases. Sadly, both limited edition. Now onto a look I created with this product. A very wearable one which I think anyone could pull off. I started with layering the cream shadow directly on to my lid, (no primer) and used my most efficient brush, fingers, to blend! Since I wanted a cleaner look, I then took the eyeshadow Primal from the Urban Decay Basics 2 palette just around the edges to smoke out and diffuse. A completely unnecessary step, but I did it anyway. Note, I didn’t layer it on the lid though. I also lined the eyes and smudged it lightly then completed the look with two nice coatings of mascara. I used Urban Decay Perversion here. Been totally loving this one lately and I think I may need to repurchase! If your budget permits, I believe this is a very good cream shadow to have. Personally I keep forgetting to use my cream shadows as I am more of a powder shadow kinda gal, but I really do love these for special occasions when I do have extra time to get ready and could truly appreciate playing with such luxurious products. The colours of these TF cream shadows are usually hard to dupe and have a glossy and luminous quality that sets them apart from the other similar products and I feel that’s what you are paying so much for. Mine was purchased online from Selfridges. Beautiful look and review. Thank you so much! I am SO jealous that you have Pink Haze and I am praying that it will make a comeback and soon!! You are so beautiful! Great review! You look absolutely beautiful here Michelle! I was coveting the Spring color and when I saw how you were wearing – an easy daytime smoky look – I had to have it! Just wondering what color liner you are wearing? Oh – and UD Perversion is my new favorite mascara. Do you use the primer also or mascara only? Thank you! I just used the Spring 2015 cream shadow all over the mobile lid. Can’t recall what I used on the lips, but the cheeks are most likely NARS Madly 🙂 It’s perfect for pairing with smokey eye looks and also great for everyday wear. I tend to use my fingers when using the TF cream shadows as it’s easier to keep layering colour gradually. If you like a well blended crease, you can go with a blending brush like the MAC 217 just to soften any edges, I don’t use a brush to apply them though cos it leaves brush strokes.